When I made this Low-fat Broccoli Salad I did not expect anyone to like it. In fact, I was thinking there will be a lot of leftovers was I surprised when I saw the bowl clean in the evening. I don’t know why I was surprised. We do love salads as a meal, snack as a starter or as an accompaniment and the girls may not like broccoli but in a salad, they seem to accept it. A Salad is a dish common to all parts of the world. It typically contains small pieces of food (commonly vegetables) that is spiced using dressing, sauces, or in the case of India, tadkas. It is usually enjoyed chilled. Salads contain a variety of foods from vegetables, fruits, and grains, to meat, eggs, and dairy. One of the most versatile foods, salads are served as appetisers, accompaniments (side salads), main course, or desserts. Personally, if I had to pick only one food to live off for the rest of my life, I would pick salads; simply because you can add just about anything to it and get away with calling it a salad. The word Salad comes from the French word “salade” which originally held the same meaning as the English salad. Digging deeper; it may have originated from the Latin word “sal” (salt) o “salata” (salty). In English, the word salad o “sallet” first appeared in the 14th century. Salads were especially popular during the Greek and Roman times when greens were mixed together and dressed with brine or salty oil-and-vinegar dressings. Broccoli is an edible green plant in the cabbage family whose large flowering head is eaten as a vegetable.The word broccoli comes from the Italian plural of broccolo, which means “the flowering crest of a cabbage“, and is the diminutive form of brocco, meaning “small nail” or “sprout”. Broccoli is often boiled or steamed but may be eaten raw. 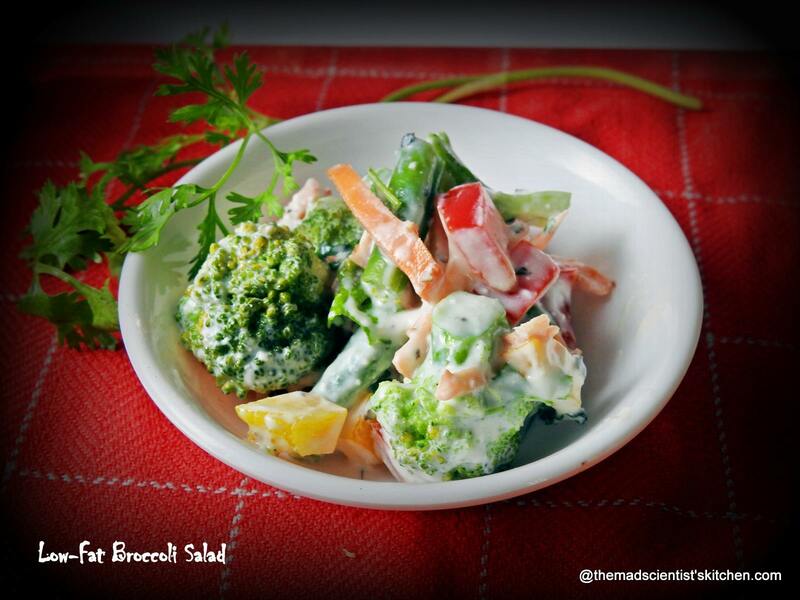 Raw broccoli is a dietary boon in case of nutritious value and a weight loss regime. It is low on the calorie count. It is a good source of protein, calcium, iron, magnesium, fibre and also vitamin E, A, C, K, and B6. This does fit in my theme this time for the Mega Marathon called #Cooking Carnival does it not? My theme is Simple and Healthy Vegetarian Food in Old Age. 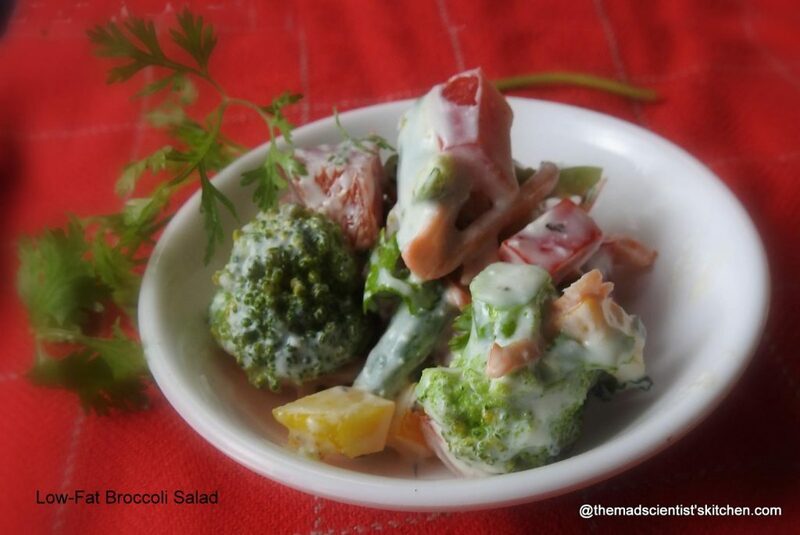 This Low-fat Broccoli Salad is simple to make and like all other salads adjustable. Add or remove what you like! Mix the yoghurt, garlic and pepper in a bowl. Add broccoli, beans, carrots and capsicum and mix them well. In case you feel like you can steam the carrots too, I did not.